It’s the natural for babies to get irritated and cry now and then! Parents and caregivers have always relied on soothing their kids with their arms. Although this method works perfectly, it is always tiring. But you can avoid all that fatigue by using a baby swing. If you get the best baby swing, your child will be soothed as you concentrate on other chores. However, there are countless baby swings in the market, and every manufacturer claims to be the best. But don’t worry, we have researched and provided detailed baby swing reviews to give you an easy time when making a decision. 2 – What are the main benefits of a baby swing? Detachable swing seat – Can the seat be removed from the frame? Some seats can be removed completely from the frame making a stationary seat for independent use. Other seats that aren’t detachable but they allow you to clip in the seat to a stationary position giving you a choice to use the whole baby swing as a frequent baby seat. Seat incline and Seat Padding – some seats allow adjustments to various recline positions. These recline positions give you baby a chance to enjoy different comfortable positions as they grow up. The seat recline mechanism also provides safety for your little one. You should choose a baby swing that has thick padding since it will make your child cozier. However, much padding isn’t very great since it takes a lot of space leaving a small room for your baby. Washability – Since a growing child will always mess, you should choose a baby swing with removable machine washable covers. Also, you can look for baby swings that come with waterproof covers that prevent spills and mess from soaking. Swing direction – Baby swings come in two swing direction modes; front to back and side to side motions. Therefore, note the direction that your child loves the most. While some babies love to be soothed side to side others, love back to front. 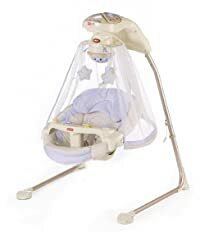 Adjustable swing speed and swing timer – Most baby swings feature an adjustable swing speed. The speed setting allows you to either speed or slow according to your child’s response. Some baby swings come with a countdown timer. This timer turns off the baby swing once it reaches zero and you have to turn it back on. Many timers can run up to 45 minutes. Some baby swings take your child’s comfort to a higher level by integrating some entertainment tools to keep your baby engaged. Music Player – plays pleasing sounds and music soothing your child to sleep. While some players come with fixed tunes, others allow you to select sounds from a variety of tracks. Toys – Some swings come with built in toys. The toys may vary brand to brand and they can be simple hanging rattles, stuffed animals or even mirrors. Theme – whether you have a baby boy or girl, you won’t lack a perfect theme for your lovely angle. However, choose colors that please your baby. Strong and sturdy – Choose a baby swing that has a strong frame material like, some frame can fail you since they are made of plastic. Foldability – At times you will want to fold your baby swing for storage or transport. Thus, choose a baby swing that is easily foldable. When purchasing a particular stroller, you should give safety a priority. 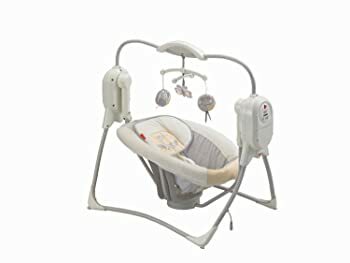 Safety feature that will help secure your baby include, point harness, weight capacity; ensure you buy a baby swing that is proportional to your kid’s weight. Other safety features include a canopy and adequate recline. 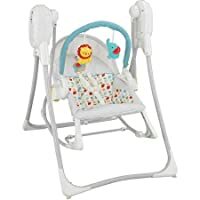 The Fisher-price is an out-of-box baby swing that comes with premium feature yet it is very affordable. It is designed for moms who want to soothe and entertain their kids at the same time. This baby swing lets you choose from different seat positions; Recline, upright, left, center to soothe your child in the loveliest position. It combines the traditional and contemporary swing mechanisms to offer your child the best since you can choose head-to-toe swing or side-to-side cradle. Which swing speed is best for your kid? 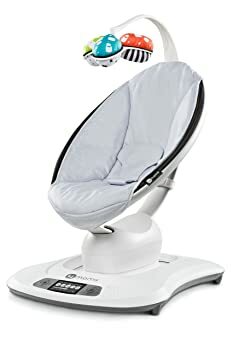 You can’t determine the best speed unless you use variable speed settings; this swing features up to 6 swing speeds letting you select the perfect motion for your baby. With 16 soothing tunes and gentle nature sounds, your child will love the soothing experience. Also, it has motion on the motorized mobile. The entertainment is not yet over! It comes with little birdies that “fly” overhead to entertain and soothe you baby. The seat has thick plush padding that offers exceptional comfort to your baby. It is easy to operate so you won’t face any challenges as a mom or caregiver. For convenience, this baby swing has 120 volt AC adapter allowing you to save on batteries. This ergonomic baby swing comes with machine washable covers, so you are assured of keeping your child in a fresh environment. Do you want to soothe and give supreme entertainment to your baby? The My Little Snugapuppy baby swing will help you do it! 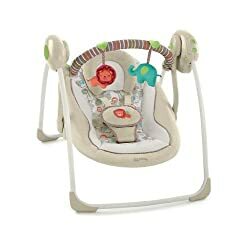 This baby swing is very versatile and comes with numerous features all meant to please your baby. It comes with 2 swing motions to cradle your baby to sleep; head to toe swing and side to side cradle. Most children love nature songs, and this baby swing features multiple nature sounds tailored to soothe your kid. Apart from these sounds, your baby will also enjoy the pleasing multiple songs that come with this swing. Other entertainment features include animal friends that “dance” overhead. This baby swing is specifically built to relieve you the fatigue of soothing your baby every time he is crying. It includes 6 swing speeds featuring SmartSwing technology. You will be able to choose the best swing for your child according to their age. The My Little Snugapuppy features a leg fold mechanism that makes the unit ideal for transport and storage. You will appreciate the 120 volt AC adapter that allows battery free operations, or you can use 4 D batteries. This baby swing is very beautiful and has received a lot of market acceptance becoming a bestseller; so you will love it. Spot cleanable ensuring a clean environment for your baby. Safety has never been this serious! The Price Papasan Cradle Swing is built with safety and comfort in mind. For safety, it comes with 2 position reclining seat featuring 3 point restraint. Therefore, this baby swing can’t topple when your baby is on board. It comes with 6 soothing speeds so after putting your baby in the seat just select your preferred speed. This baby swing gives your child a smiling face all through! 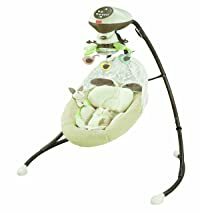 This ergonomic and entertaining baby swing has 16 songs; 8 day time songs and 8 night time soothing songs; thus your child will love the pleasing experience. The Papasan Cradle Swing features a comfy, cozy and supportive design. It has beautiful and luxurious fabrics that match with your nursery theme. This seat is thickly padded to give your child enough leg and head support. Also, this baby swing has an adorable canopy that stimulates your kid’s visual sense. It has an exceptional steel frame that makes it very sturdy and durable. If you have been using a difficult baby swing, it’s the time you appreciate this easy-to-use unit. It has a simple volume control to ensure you choose the correct sound for your baby. The unit is also very simple to assemble and as a mom you will use it with ease without requiring any additional help. When you choose the Graco DuetSoothe, you get a more! It is two-in-one equipment, a swing, and rocker. Just what your baby wants! This baby swing gives you a chance to choose either a rocking or a swing function. It’s a sturdy and strong baby swing build to last for long. It features a metallic and plastic construction ensuring durability and a stable unit for your child. Also, it has a carry-handle so you can keep your baby close for easy monitoring. Your child will also love to be close to the parent! It’s designed to suit both the parent and child. 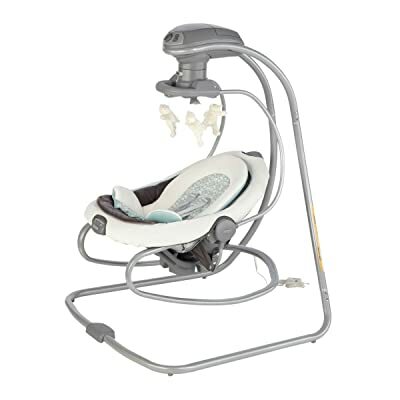 The Graco DuetSoothe comes with 3 seating positions allowing your child to swing front to back or sway side to side. It accepts a minimum weight of 5.5 pounds and a maximum weight of 30 pounds. As your kid grows, they will appreciate the variable speed settings that give the child extra comfort. You don’t even have to worry about the power requirements! You can use batteries or plug this baby swing. Above all, it weighs only 25 pounds making it portable, and it is very affordable. 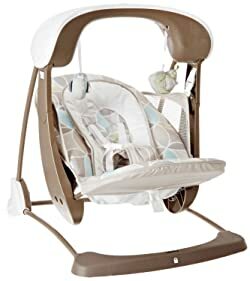 Moms who love versatility will love this baby swing that’s why it has featured in our baby swing reviews. It allows you to either use batteries or to plug. It features metallic and plastic construction for durability. 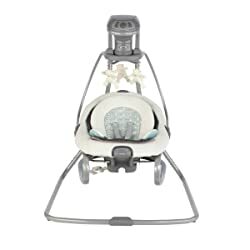 The Fisher-Price Power Plus SpaceSaver Cradle ‘n Swing is great for your newborn, infant or toddler. With this swing, you can reduce space use by about 40%. It even comes with a power adapter for optional battery-saver operation. It’s designed with two different swinging motions to suit your baby’s mood-swings. The gadget has six swing speeds which give you the convenience to swing your baby either side to side or traditional head-to-toe with ease. The SmartSwing technology senses the baby’s weight for better comfort. Its melodies and the three sound toys on the overhead soothe and entertain your baby each time. The toys also distract your baby giving you enough time to do your other chores comfortably. The swing has a handle for easy carrying from one place to another. You don’t need to push the baby cradle to start because it features the SmartSwing technology. It is easy to operate because you only need to plug in and you will be ready to soothe your baby. Its power plus adapter helps in saving power for future use. This baby swing is meant for mothers who want to comfort their baby without any pain. 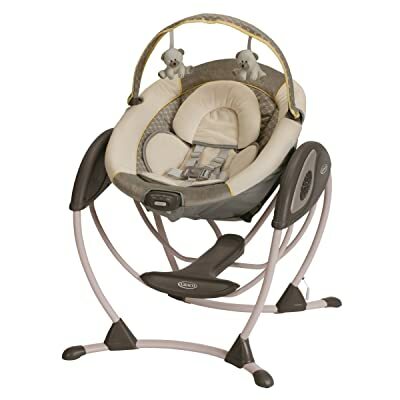 The Fisher-Price 3-in-1 Swing ‘N’ Rocker helps to calm your baby by swinging and rocking them. Six unique swing speeds sense your baby’s weight for timeless comfort. Its speed doesn’t slow the swinging motion of the rocker as your baby grows. You can also adjust the swinging speed from low to high giving your baby the right motion. 16 different songs create a soothing environment that helps your baby to calm. A removable toy bar creates a playful environment for your baby. It can be used as an infant seat or rocker for either playing, feeding or napping with ease. This rocker has a comfortable seat that holds up to 40lbs so the newborn can continue to use to an older age. It also has seat handles making it easy to remove the seat from the swing frame for use as an infant seat or rocker. The rocker features a SmartSwing technology that helps the gadget to start without a push. You can rely on this rocker to calm your baby anytime. It also swings your baby countless times giving your baby the needed motion for a couple of hours. 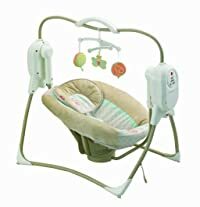 Even with all these features, this baby swing is highly affordable. Do you want a highly portable baby swing? The Comfort and Harmony Cozy Kingdom may be your choice. It is a highly comfortable baby swing that weighs only 7 pounds an incredible weight! Thus, you can move around with your baby. It features true speed technology that most moms want. It has up to 6 speeds to suit your growing baby child needs. It’s advisable you use low speed for your young baby but gradually increase the speed as your baby grows. However, try different speeds to see the one that works perfectly for your baby. All the inclusions in this baby swing are directed towards your child comfort! It has a deluxe seat that offers unparalleled comfort. This head support is also removable, and thus you can wash it in the case of any mess. It also comes with machine washable seat pad to ensure a fresh environment for your child. To ensure premium entertainment for your little one, it comes with plush toys that “fly” overhead to please your baby. You baby won’t even be distracted by outside noise since this swing has 6 melodies to entertain your baby. It folds in just a snap ready for travel. The Fisher price Deluxe is all that you have been looking for to soothe and comfort your baby. This affordable, lightweight baby swing weighs only one pound. It is easily convertible to a stationary calming vibration baby seat. So you can constantly use this swing as a baby seat. 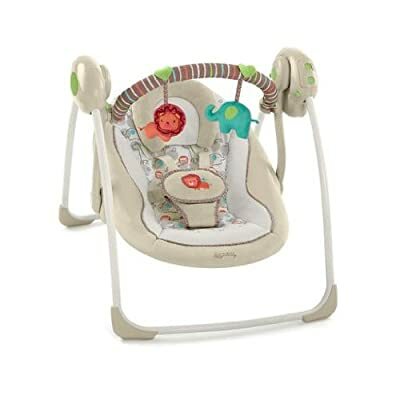 It features Fisher Price smart swing technology that offers standard require swing motion. This baby swing has up to 6 soothing speeds giving you a chance to the best speed for your baby. 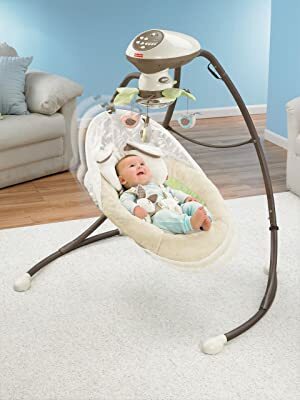 It is the best baby swing for crying and sleeping babies. For children who don’t like destructing noise, there it comes with 10 pleasing tunes and nature sounds. You child will love the soothing experience giving you more free time to handle other jobs. The out-of-box design features 2 birdie toys overhead so that your baby stays engaged. The Fisher price deluxe is not like other baby swings that are designed for particular gender! It features beautiful neutral colors that are unisex and thus perfect for both boys and girls. It is even certified frustration-free; thus, it causes no harm to your lovely baby. The Graco Glider LX is the best baby glider since it features excellent innovation to give your child enough swinging comfort. This exceptional innovation gives this seat ability to swing your child with the same motion as you would do it with your arms. It comes with a compact frame that utilizes 40% less space as compared ordinary baby swings. 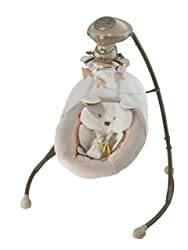 This baby swing gives you the convenience of use since it can use batteries and at the same time accepts plug-in. it is designed for the art of comfort for both boys and girls that’s why it has appeared in our baby swing reviews. This baby swing features thick plush padding so that your kid’s head and legs are comfortable. It’s a roomy seat that can secure kids up to a weight of 30 pounds. The swinging motion is coupled with vibration to keep you baby cozy. With a background soothing music; 5 nature sounds and 10 classic melodies, you child will be constantly entertained and stay away from destructing noise. It offers multiple gliding options to help keep your child contented even in their worst moods. Other comforts and entertaining features include 3 reclining positions and removable toy bars. It offers gentle gliding motion for your child. It produces some noise when swinging. The music feature may stop functioning soon that you expect. The 4Moms Mamaroo is designed for those who want to comfort their baby in style. Its ergonomic style allows you to soothe your baby from any location. You can move it to any room and even outdoor effortlessly. Plus it comes with multiple entertaining features that every child will love. When you want to soothe your baby, simply choose from five unique motions. The tree swing and car ride are the best motions of this item. You can even select five different speeds that will sooth your baby in style. Moms love it because it bounces up and down mimicking the movement of hands. The side to side bouncing makes the seat even better. With multiple entertaining features, this seat can soothe and entertain any baby. It offers you a range of five built-in sounds that your baby can sing along. You can even connect an MP3 player to enhance your baby’s entertainment. The seat features multiple recline positions allowing your child to lie back and relax. The recline positions also allow your baby to either play or sit up. If you want to improve your baby’s experience, you can consider this seat. A baby swing is the best way to soothe your baby to sleep; it’s even perfect for troublesome babies. As a baby swing soothes your baby, you will have ample time to tackle other house and personal chores. However, you should ensure you choose the best baby swing for your baby. Our baby swing reviews will help you make a right decision when it comes to buying perfect equipment for your child. Feel free to choose one of the baby swings reviewed above because our reviews are authoritative. Baby swings come with numerous features all meant to entertain, soothe, delight and amuse your child. A baby swing that comes with more features allows the parent to concentrate on other things while the baby is in the swing. Some of the outstanding features of baby swings include. The melodies and soundtracks are meant to entertain and soothe the baby. While some swings come with polyphonic tunes, others come with natural sounds. Your child will be happy to listen to numerous songs or a particular song. Some sounds are meant for daytime while other are specifically meant for night time. Every baby swing features a motor that controls the gliding and swing motions. They initiate the soothing aspect that kids love. The motor may be designed to provide side to side or head to toe swinging motion. Baby swings come with harness points either 3 or 5. These harness points provide unparalleled safety for your baby. A baby swing that has 5-point harness is more desirable since it is more secure than one that has a 3-point harness. Babies require seating in different positions to avoid fatigue. Hence, baby swings come with various reclining positions to ensure enough comfort of the baby. Most swings come with up to three reclining positions. A great baby swing should have thick seat padding. These seat pads are responsible for comfort and safety. Also, a baby swing comes with headrest and leg rest that ensures the kid is secured properly when in the swing. The frame is the most vital part of a baby swing since it holds all other parts in place. Frames come in different shapes like puppy, square, round and other designs. Also, the frame may feature a metallic or plastic construction. A metallic frame is stronger and provides enough stability for your baby. A baby swing is either powered by batteries or plug; wall outlet. The batteries or plug powers the motor and the “flying” toys or birds. Most swings are powered by 4 or 5 D batteries. When you have to plug the swing into a wall outlet, you will require 120 volts or 110 volts. A baby swing is designed to entertain your child more than you would do it with your arms. It comes with toys and melodies that most kids love. You won’t be able to entertain your baby like a baby swing can do. Beyond the entertaining features, baby swings are meant to soothe your baby. Most swings come with swinging speeds and different speed settings to allow you to choose the best for your baby. Whether, you baby is very tender or a bit aged, he will be secure despite his mood. Baby swings are also designed to secure your child. Your baby will have superior security since swings come with harness points and thick padding. Other aspects that ensure enough security for your baby include headrest, leg rest and a sturdy frame.